The musk ox is a social species that lives in large mixed herds. Both the male and female have horns that meet in the middle of the skull and curve down and out. When threatened by predators like wolves and bears, they stand together in a protective circle with calves inside and adults’ horns facing outward. 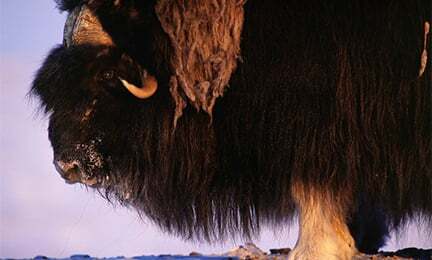 The musk ox’s name is derived from a characteristic musky odor produced by the male during mating season.